Milk cooling affects milk quality. The quicker the milk is cooled after milking, the better the quality when it is collected from the farm. Milk cooling accounts for about 30% of the total energy costs of operating a dairy. Energy demand and farm diary operating costs can be reduced using different options that involve heat recovery from your cooling system. Raw milk grows bacteria rapidly above 7°C. Meeting the new milk cooling standards, which come into effect for all farms on 1st June 2018, may mean changes are required for your system. The Ministry for Primary Industries New Zealand Code of Practice for the design and operation of Farm Dairies has new milk cooling standards. d) must not exceed 10°C during subsequent milkings. In situations where there is continuous or extended milking, such as automated milking systems, the milk must enter the bulk milk tank at 6°C or below. “Continuous or extended milking” is defined as milking for six hours or longer from the time that milk first enters any bulk milk tank. Will you meet the new standards? 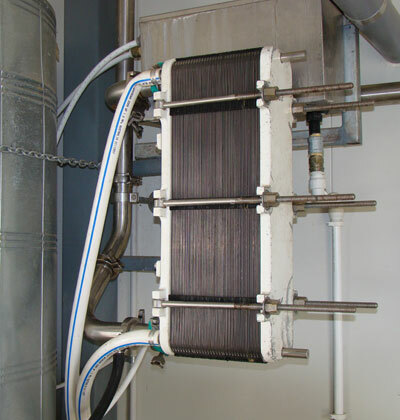 Check the performance of your current plate heat exchanger. See 'checking the performance of the plate cooler' further down the page. Consult with your milk company to determine if your current system will meet the new milk chilling requirements. Download: New Zealand Code of Practice for the design and operation of Farm Dairies. Plate Heat Exchangers (PHE) are the most cost-effective way to cool milk. A PHE consists of a series of very thin stainless steel plates. Water flows along one side of each plate while milk flows along the other. Heat is transferred from the milk to the water via the plate. The capacity of a plate cooler is adjusted by adding or subtracting plates. The easiest way to check the effectiveness of your plate cooler is to compare the temperature difference between the incoming temperature of the cooling water and the outgoing temperature of the milk leaving the plate cooler. An efficient PHE should cool milk to within 2°C of the water before it enters the PHE. For example, if the temperature of the incoming cooling water is 14°C, the temperature of the milk exiting the plate cooler should be about 16°C. Figure 1. A strip thermometer attached to the milk outlet pipe. One simple way to check this is to use a PVC strip thermometer. These thermometers have a paper backing on them, which is peeled off and stuck directly onto a clean, dry metal pipe (Figure 1). Locate the water inlet pipe and the milk outlet pipes as they enter and leave the plate cooler respectively. Find a location for the thermometer that allows it to wrap around the outside of the water inlet pipe. It must be placed on a metal pipe so you may need to move the rubber hose a little to make enough room. A piece of electrician’s or gaffer tape on each end of the strip can help you with initial positioning. Rotate the thermometer to ensure the temperature range you expect from the pipe is visible. Repeat the process by applying another thermometer strip to the milk outlet pipe. The temperature blocks light up with the brightest one being the temperature of the pipe. At the next milking check to see if the required temperature range is visible. Remove the tape on thermometer strips and once the pipes are clean and dry, remove the paper backing and stick the strip thermometers permanently to their respective pipes. Check the two temperatures during peak milk flow from the milk pump. If there is more than 3°C of difference – there is room for the plate cooler’s performance to be improved. In this situation consider checking the water and milk flow rates through the plate cooler. The system should be designed for the peak flow of milk expected from the milk pump. A water flow matched to the milk flow will make the plate cooler system easier to size and make efficient use of the cooling water. 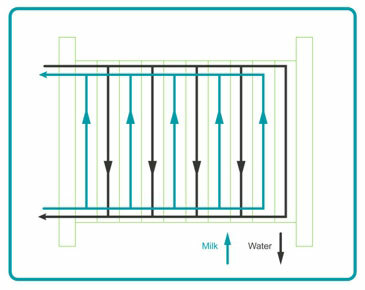 ‘M-series’ plate coolers work most efficiently with a water to milk flow ratio of 3:1, whilst 2:1 or even 1.5:1 is adequate for the newer industrial models. Check the ratio at peak milk flow. Use a bucket of known volume (i.e. a 20kg detergent container = 23 litre bucket) and a stop watch. Flow rate (litres/second) is calculated by dividing the number of litres (L) by the time in seconds (sec) it takes to fill the bucket. Turn on the plate cooler water pump and record the time taken to fill the bucket at the water discharge point. 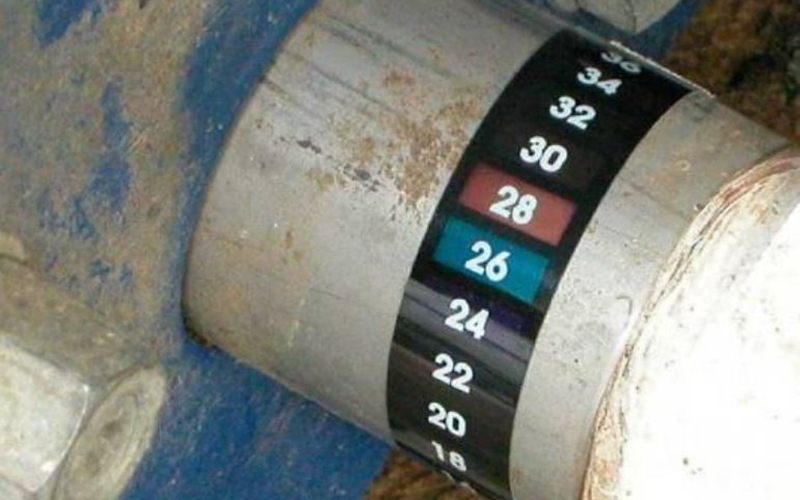 You should measure at the discharge point to account for any flow rate restrictions in the pipe work downstream of the plate cooler. Calculate the cooling water flow rate. For example if it takes 15 seconds to fill a 23L bucket the flow rate is 23/15 = 1.5L/sec. At the next milking, if it is easy to do, record the time taken to fill the bucket with milk at the tank entry point. For example it may take 45 seconds to fill a 23L bucket (23 divided by 45 = 0.5L/sec). Aim to take this measurement while the milk pump is working at capacity (i.e. lots of clusters attached to cows at peak milk flow – just after cupping up a whole side). For larger dairies and bottom loading tanks these measurements are best undertaken using water (instead of milk) at a simulated milking. Divide the cooling fluid flow rate by the milk flow rate to determine the ratio. In our example this would be 1.5 divided by 0.5 = 3. Therefore the cooling fluid flow rate is 3 times the milk flow rate – a ratio of 3:1. This ratio would indicate that the problem lies elsewhere as it is in the correct range. Note: Improving the efficiency of plate cooling is likely to require the services of a skilled technician. Cleaning the plates is not an easy task – it is time consuming and best left to experts. Inefficient systems may need resizing, extra pumping capacity, additional cooled water storage or a complete dismantle and service. The additional capital and service costs should be considered against the annual costs of using an inefficient plate cooler. The cost of an inefficient plate cooler increases in proportion to the annual milk production of the farm. The peak flow rate of milk expected from the milk pump will determine the type of pre-cooler (size of the plates) and number of plates required. Allow about 3mm per each plate and gasket. If too tight the fluid flow will be restricted. Measure the overall thickness of the plates before disassembly. Never take the plates completely off the guide rails. Contaminants in either the water or milk that adhere to the plates will affect heat exchange capacity and reduce performance. Blockages to the flow can restrict flow over the heat exchange surfaces. Ideally plate coolers should use the coldest available water on the farm. Some fluctuation in temperature can be expected over the year, but this is still an inexpensive way on most farms to initially reduce the temperature of milk from around 35°C to <18°C, and will significantly reduce the load on the refrigeration system. The cooling fluid should flow in the opposite direction to the milk. If not, the heat transfer is reduced. The system should be designed so that water is only pumped through the cooler when milk is also flowing through it to save energy. Some advisers insist that the milk be pumped into the bottom of the cooler so it fills all plates evenly (at low flow rates) as it rises to the top of the plates to exit. The ‘M-series’ plate coolers are the most common type found in New Zealand dairies and are available in 'single' bank and 'double' bank configurations. The ‘M-series’ is designed to handle milk flow rates of up to 4,500 litres per hour. Industrial plate coolers are more suitable in situations where milk flow rates exceed 4,500 litres per hour. Industrial plate coolers are much bigger in size than the ‘M-series’ and are designed for flow rates up to 12,000 litres per hour. In refrigerated/direct expansion tanks the refrigerant is pumped into the jackets (evaporators commonly referred to as ‘dimple plates’) on the internal surfaces of the bulk milk tank. Here the refrigerant expands as it takes heat from the milk, is pumped out of the jackets, compressed, then pushed into the condenser. The hot refrigerant is cooled by air (or water) flowing through the condenser fins. The cooled gas condenses into a liquid and is pumped back in to the jackets around the bulk milk tank to start the cycle again. Direct expansion has the disadvantage of maximum power draw during and after milking which is generally peak rate. If large electric motors are used there can be problems in areas of poor power supply. Direct expansion refrigeration systems are pressurised, which means they require a skilled technician for maintenance. If your current plate heat exchanger and refrigeration unit combination are not capable of meeting the new milk cooling regulations you may need to consider a secondary cooling option. These can involve a large capital outlay and long payback period but may come with the benefit of heat recovery, enabling you to save on hot water costs. Carefully evaluate all options to ensure the system is fit for purpose without over capitalising. The Genesis milk cooling tool can help you to calculate the benefits and payback periods for many of the secondary cooling systems mentioned below. Cooling towers can be very effective at cooling water especially in areas of low humidity. Water can be cooled to within 5°C of the wet bulb temperature in a properly designed plant. The most effective plants are fan forced and turn over a large store of water every hour. They operate overnight to cool a large volume of water, usually 4½ times the volume of the daily milk yield. Ice banks generate ice along evaporator coils using night-rate power. The ice is used to chill water for the pre-cooler. The warm water is then returned from the pre-cooler to the top of the ice bank and cooled again as it runs down the ice. These systems can require more maintenance than other systems and are not as energy efficient as a direct expansion vat. If working on night rate electricity rates they may save money even though they use more energy. Ice banks take up less space than storage of chilled water. Another option is to use a refrigeration system to cool water or a food grade glycol/water mixture. Glycol systems tend to use a very small volume of fluid and create the chilled fluid on demand (at milking time). Note that a system that is designed to chill milk to 4°C in line i.e. prior to vat entry, will need a much larger (and more costly) compressor than an in-vat system. Generally, these systems are a big capital expense. Thermal storage systems chill water using off peak power and require an insulated storage tank to hold a large (one day’s milking) volume of chilled water. Using more energy than a direct expansion tank they have advantages relating to installation and maintenance procedures. Vat wraps are only utilised by 20% of dairy farms in New Zealand but can save around 15-25% of milk cooling costs. They insulate your milk from outside temperatures and weather, preventing it from heating up and reducing energy used by the refrigeration unit. Effectiveness of a vat wrap will depend on whether your vat is inside or outside and where in New Zealand you are located. Estimate savings from vat wrap installation and payback using the Energy Efficiency and Conservation Authority (EECA) calculator. Install strip thermometers to the plate cooler water inlet and milk outlet pipes to monitor its cooling effectiveness. If there is >3°C of difference in the temperature between the cooler water inlet and milk outlet pipes consider checking the cooling fluid to milk flow rate ratio at peak milk flow. Discover the benefits of ensuring you have the correct cleaning process. Maintain milk quality by aiming to remove all milk residues and destroy any resident bacteria. New Zealand Code of Practice for the design and operation of farm dairies.